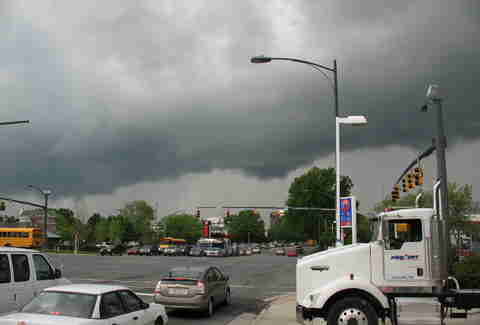 Charlotte weather has always been a bit unpredictable. Hot one moment, cold the next; torrential downpours and flooding followed by sunshine and rainbows. 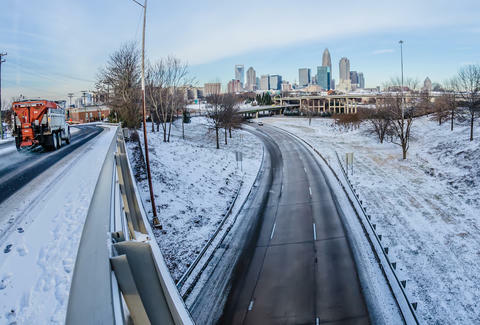 The seasons are changing in the Queen City, but even if you're prepared for the uncertain Charlotte weather there are forces at work against you. Charlotte's oft-failing infrastructure and way of doing things can feel as old as the city itself. Additionally, Charlotte is located in Mecklenburg County, which is an enormous 546 square miles. This makes it tricky to provide services where they're really necessary -- especially when it snows. In 2004, the entire county had about two snow plows. That was the year that nearly 2ft of snow fell in parts of Mecklenburg County. Needless to say, the city was at a standstill. Since then we have increased our number of plows, but they're still not at a number to best serve a county our size. 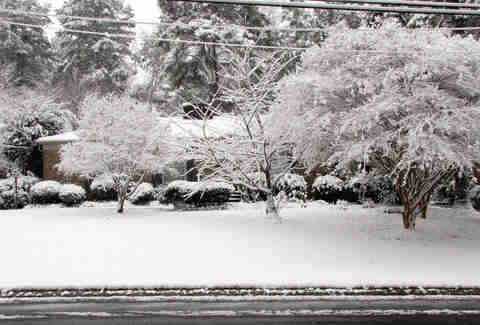 At the same time, there may be only 1in of snow on the ground in South End and 7in of snow on the ground in Cornelius. Yet school closures are made for the entire county. Our lovely tree-lined streets can be as treacherous as they are welcoming. Whether diseased or suffering from a cankerworm infestation (yuck), it seems when the winds pick up and the storms come in, trees inevitably fall. Sometimes our county takes care of these issues, but it is mostly up to property owners (pro tip: check up on the trees in your yard or near you and trim branches regularly). The population of Charlotte is estimated to grow by 21% by 2030 -- will the Queen City take care of its trees, increase the number of plow trucks, or update the poor drainage and road conditions that cause many area roads to flood during storms? We don't have the answers, but we do know how you can stay sane during one of the sure-to-happen crazy Charlotte weather events. Be safe and smart out there… and make sure to always have bread, a flashlight, and bourbon on hand no matter the situation. Survival essentials: Musically talented friends, access to a fire pit, old-school board games, flashlights, candles, red wine, and non-perishable snacks. The sky is a gorgeous Carolina blue before it suddenly darkens and the wind starts to blow. In a moment, the clouds open and a ferocious storm is upon you. The lights where you are start to flicker and just as soon as the storm came, it leaves, but it takes a few trees and the power with it. So what do you do now? Grab all of your candles, pull out all the board games you have, and call/text your friends and neighbors with whatever power you have left on your phone (just because the lights are out doesn't mean you can't have fun). Bonus points if you or your friends play instruments; you can have a jam session by candle or firelight. 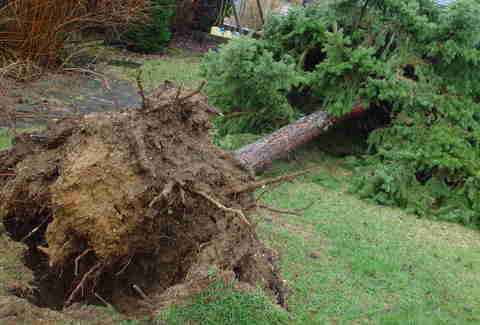 If the tree is blocking the street, call 911 and make a service request with the county when the power comes back. Survival essentials: Lots of alcohol, non-perishable food, charger for your phone, books and magazines if the power is out for a while, candles, flashlights, and batteries. Many Charlotteans still remember Hurricane Hugo from 1989, and this past September, Tropical Storm Julia made her mark on the Carolinas. Hurricane season lasts until Nov 30th, and that means there's still time for a major storm to blow through town. Vicki Graf, a WSOC meteorologist, says her team has been tracking a variety of models to figure out the likelihood of a hurricane. "Right now some of those trends are indicating that we could be shifting to a La Niña event, when the sea surface temperature across the equatorial Eastern Central Pacific Ocean is lower than normal... which would have more of an impact on hurricane season," says Graf. "Yes, it is still possible we could see a tropical system in the Carolinas!" In 2008, North Carolina farmers suffered an estimated $500 million loss in major crops because of La Niña, so don't wait until a hurricane hits. If Graf or any of our other meteorologists tells you a hurricane is going to hit the Queen City, stock up on non-perishable food and water. In case power goes out, have things around to keep you occupied and entertained, and don't forget a portable charger for your phone. Get wine, bourbon, and beer, as they are non-perishable (because milk will go bad if not refrigerated, of course). For the love of God, don't try to drive in a hurricane. Charlotteans can't drive when it's sprinkling, so don't even attempt to drive during a windy downpour. Survival essentials: Bread, cheese, tomato soup, wine for the adults, snow gear, a list of places to go if the roads are safe, and patience. Lots of patience. The announcement comes that school will be closed! Children rejoice, while parents shudder at the thought of having to take off a day from work, or having to entertain their kids for a full eight hours. The easiest way to survive this situation is to keep your kids outside! Make sure you buy them appropriate snow gear, but in a pinch track pants over sweatpants, rain boots, and some sort of weather-resistant coat will work. Keep them out there until they are exhausted with little red faces, then fry up a grilled cheese sandwich with tomato soup for dinner and hope they crash early. You'll be able to drink wine in peace, and may even be able to read the book you've had on your nightstand for the past three months. Now if you live in an area where there is no snow on the ground, I wish you the best of luck, my friends. 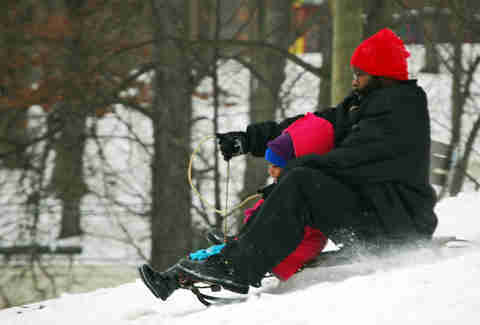 Like we said, Mecklenburg is a huge county and there's not always snow to be had. Soothing your child's disappointment is something we can't help you prepare for. You'll likely hear news of a major snowstorm before it happens, so head out before the weather really takes a turn and prepare for a lot of time indoors. If you live near bars and restaurants that will stay open regardless of weather, all you will need is a coat and some appropriate shoes to walk in the snow. If you don't live within walking distance, just make sure you go out a few hours before the storm hits and stock up on essentials like food and vodka. Then gather up some friends who you don't mind hanging with for the duration of the snowpocalypse, and pretend you're back in the dorm, frat, or sorority house for a night or two. Survival essentials: Water bottle with you at all times, a layer under your winter clothes, or a spare shirt. Get regular car maintenance -- you never know when you'll need to blast that air conditioning. 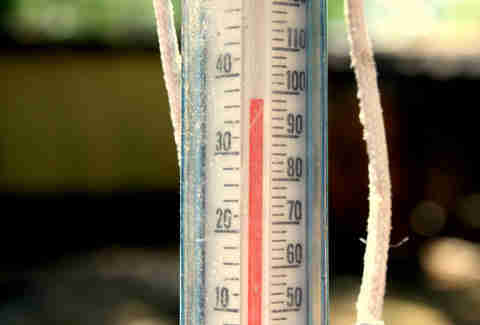 Without fail, every year there is a day that begins at a nippy 30 degrees and ends closer to 85 degrees. You're in a sweater and about to pass out as you walk from your office to your car, or trying to remember if you put on deodorant today. The only way to be prepared for this type of weather is to keep some sweat-free essentials in your car or office, but that may be unrealistic. Instead, head to your nearest bar and drink a cold beer while basking in the glory of its air conditioning. Bonus points if you find a fan to sit in front of and air out your pits. Survival essentials: Know routes to and from your home, don't speed through standing water, don't try to gun it through rushing water, and be smart. As my grandma would say, "Use your brain." 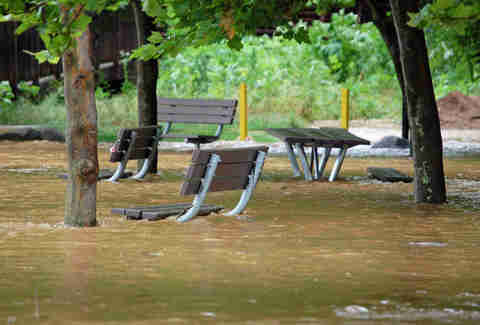 According to the Charlotte-Mecklenburg Storm Water Services, flooding is the No. 1 natural hazard in Mecklenburg County, both in terms of frequency and damage to property. The Northwest may get all the rainy glory, but Charlotte gets more rain annually than Seattle -- and in fewer days. Charlotte's infrastructure, particularly drains and roads located on floodplains, contributes to standing water and flooding. This is apparent in various areas around Charlotte (like Myers Park, Dilworth, University, and South Charlotte) where, during heavy rain, roads will flood from lack of proper drainage and creeks rise too quickly. Before buying or renting a home, make sure you know whether you are on one of the floodplains located throughout the Queen City. If you are, look into getting special insurance. If your home is fine, but you live near a road that floods or has significant standing water during storms, find alternate routes that will get you around the city that won't put you in danger. After all, no one wants to cause a massive wreck or be that person on television that needs to be rescued from their car as the water rushes past them. Erin Maddrey believes in being ready for any situation, which is why she always has flashlights, candles, bourbon, and KIND bars on hand. Follow her on Twitter and Instagram @ErinMaddrey.